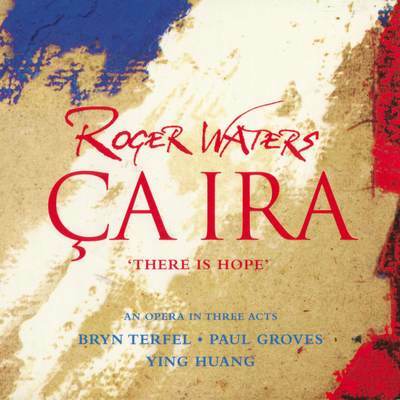 Roger Waters, the man who equated “education” with “thought control” in his pseudo-opera The Wall, is now back and appealing to higher culture in his new opera Ça Ira. Moreover, this is a real opera, with singers, a chorus, and an orchestra with not a single dreamy, overlong electric guitar solo in sight. Fans of Pink Floyd will find little in Ça Ira to satisfy their jones for “the Floyd,” although there are many standard musical features associated with the classic rock staple group that have been carried over into this work — crushingly slow tempi, somber and monotonous singing, and a mania for pristine recordings of sound effects. At one point, a volley of musket fire makes you jump out of your seat. Ça Ira was undertaken with librettists Etienne and Nadine Roda-Gil not long after The Wall, but it took Waters so long to put the finishing touches on it that his collaborators have since died. Waters made a smart decision in using librettists for this project, as his own corroded worldview would certainly have undone the basic idea, the message of which is “there is hope.” That said, the Roda-Gils took on too large of a swath of the French Revolution to cram into three acts, and the listener gets no more than a picture postcard sense of its flavor. All of the principal singers in this recording are required to take on multiple roles in Ça Ira, and this results in a twofold effect. The first is that it brings Ça Ira into the realm of opera-oratorio, and even to some degree Brechtian “Lehrstück,” and secondly, it’s hard to tell what character a singer is supposed to be portraying if one is not following the libretto. Expect the motion picture version soon! Naturally, Bryn Terfel and Ying Huang are top-drawer opera singers, and Terfel relishes the opportunity, chewing on as much scenery as he can get his hands on. Huang, for her part, hangs in there, but she does not sing as though she loves this material. Ça Ira would be a hard opera for a singer to love, as there is no characterization through the singing whatsoever, and characters themselves are not given enough of the floor to engage us. 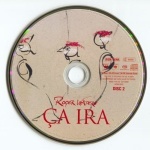 The orchestration is handled with taste and some sophistication, but in terms of melody, Ça Ira is the sing-songiest opera since the pre-revolutionary days of Thomas and Sally. Wherever the fundamental of the harmonic movement is, the melody line follows, and vice-versa. In spots where there is no harmonic foundation, Waters resorts to scalar or bugle-call like figures that, while effectively passing as notes to hang the words onto, do not constitute melody in and of themselves. This kind of texture overall would be tremendously monochromatic and dull for the average opera listener.